Barreto, P., & Silva, D. 2013. 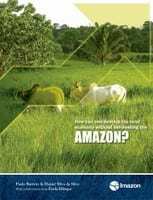 How can one develop the rural economy without deforesting the AMAZON? Belém: Imazon. It is possible to combat deforestation of the Amazon and promote the growth of the rural economy in the region. That tendency has been occurring since 2007 and may become consolidated over the next few years. The critical factor in increasing production without deforesting is to increase productivity, especially for ranching, the main use made of deforested areas. We estimate that it would be possible to supply the increased demand for beef projected up to 2022 by increasing productivity by around only 24% of pasture with agronomic potential for intensification existing in 2007. Thus, it would be possible without deforestation to increase the value of agricultural ranching production by around R$ 4 billion by 2022 ­ a 16% increase in the value of agriculture and ranching in 2010. In order for agricultural and ranching production to grow only in already deforested areas the public sector needs to correct failings in policies that discourage investment in those areas and others that encourage deforestation.